Anne Bradstreet was a distinguished English poet and the first female Colonialist to be published. Bradstreet (neé Anne Dudley) was born on March 20th, 1612 in Northampton England. Bradstreet was born into a prominent and wealthy Puritan family, allowing her to grow up in a cultured environment where she was tutored in history, literature and language. Bradstreet was an extremely well-educated young woman, especially for her time when education was a field reserved specifically for men. At the age of sixteen Bradstreet married Simon Bradstreet (who would later become the governor of Massachusetts Bay Colony) and shortly thereafter in 1630 Bradstreet, her husband and family left for Massachusetts. After their arrival to Cambridge, Massachusetts (which at the time as named Newe Towne) Bradstreet gave birth to her first child Samuel in 1632. Throughout her life Bradstreet gave birth to eight children. Due to the credibility of her husband and father, Bradstreet achieved a high social standing within the town and lived a very comfortable life. Bradstreet’s life, in accordance to the social standards and expectations of the time, would have been considered extremely successful based off of her husband’s achievements and her ability to bear eight children. Bradstreet, however, being an educated woman wanted more for herself and presumably felt it was important for her to express herself. Bradstreet’s poetry is incredibly groundbreaking for its time and deals with issues such as politics, medication, history and religion. One of the major themes throughout her poetry is the role of Puritan women. Bradstreet often questions the social expectations of Puritan women by using metaphors and a sarcastic tone. For example, in her poem The Prologue, Bradstreet sarcastically notes that many men may believe her hand, as a woman, is not fit to be a writer but rather say “my hand a needle better fits” (Bradstreet). Due to the fact that Bradstreet’s poetry was so brazen not only because she was a woman but because of the subject matter as well, Bradstreet’s brother in law, Reverend John Woodbridge, felt it was necessary to include a preface in her first published book of poems (which was published in London in 1647) called The Tenth Muse, Lately Sprung Up in America, By a Gentlewoman in those parts. Woodbridge, in his preface, essentially convinces readers (who were presumably mostly male) that Bradstreet is a well behaved lady whose main concerns are her husband and household and that her poetry is written only in her free time. The Tenth Muse…is the only book of Bradstreet’s poems to be published during her lifetime. Bradstreet died on September 16th, 1672 at the age of sixty. 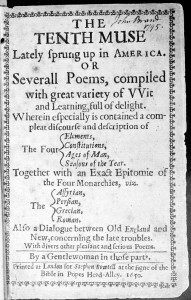 Shortly after her death in 1678, her self-revised book of poetry called Several Poems Compiled with Great Variety of Wit and Learning…is published. Bradstreet was an incredibly prominent figure in literature due not only to her talent but also to her audacious ability to speak out against the societal norms of women. Bradstreet certainly helped to change the expectations of women and made it more acceptable for women to seek out an education and to express themselves artistically. “Anne Bradstreet.” Wikipedia. Wikimedia Foundation, 05 Oct. 2015. Web. 06 Oct. 2015. Pechman, Alexandra, and Anne Bradstreet. “Prologue.” Poetry Foundation. Poetry Foundation, 2015. Web. 06 Oct. 2015. The Open Anthology of Earlier American Literature: A PSU-Based Project by Shana Rowe is licensed under a Creative Commons Attribution 4.0 International License, except where otherwise noted.